At the heart of the CPS is the Corrugated Plate Interceptor (CPI) plate pack. The plate pack design minimizes the distance a free oil droplet must rise before coming into contact with other oil droplets. 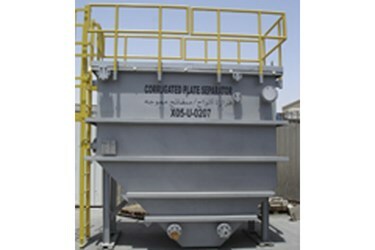 This design ensures that the oil droplets coalesce on the undersides of the corrugated plates, facilitating the free oil removal process. The configuration and number of plates of the CPS units provide enough effective area for free oil removal down to 15 ppm with greater than 60 micron removal. 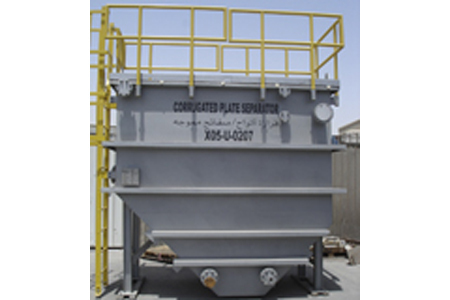 Since the plates are arranged parallel to each other with a 3/4-inch (2 cm) spacing, the separator is able to tolerate up to 100 ppm total suspended solids without affecting the effluent quality. Typically, these units are one-fifth the size of an in-ground API separator, and produce a finer effluent quality.